The above graph shows the growth in prices for single family homes (houses) since January of 2012. The red circles indicate the introduction of the 15% Foreign Buyers Tax in Vancouver and most of the Fraser Valley (August 2016) and then in Ontario (April 2017). 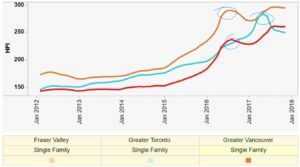 As you can see Vancouver and Fraser Valley sales have surpassed the pre Foreign Buyers tax peak but Toronto has not. This graph shows that the Foreign Buyers Tax had less effect on Vancouver apartments and little or now impact on Fraser Valley apartments. 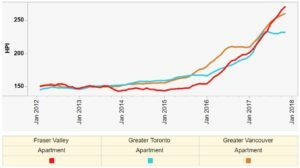 Toronto apartment prices appear to have stalled. 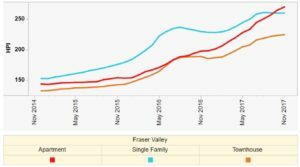 This graph focuses exclusively on the Fraser Valley and indicates the increased values of apartments vs houses vs town houses. As you can see house and town houses (to a lesser extent) prices appear to be leveling off while apartment prices are on fire. The Fraser Valley condo market makes me nervous from the Buyer’s perspective.